A development on from Boltons brilliant ‘Loony cycle’, this modified scooter has an automatic self-balancing mechanism based on a high performance ducted fan blowing air through two conical nozzles, a bit like a Harrier jump jet. By changing the airflow between the nozzles, the bike can be made to lean and hence steer. For 2003 Cyber snail has been fitted with steering. 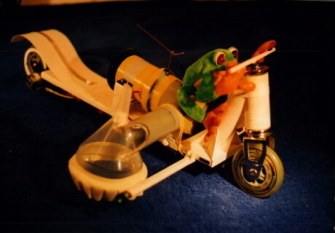 This is done using a radio controlled ‘beard’ whose angled bristles are turned by an inverted servo giving vectored thrust to the front of the snail which then turns, despite the Gyro trying to keep it straight. Improved batteries and bristle positioning give a significant increase in speed. See BBC page for more general details.